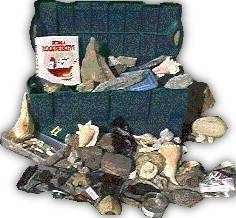 More than 80 awesome rock, fossil, and mineral samples with Mysteries for groups as large as 50 students, or for weeks of home schooling. See, What Kids Say for comments from homeschoolers. We will customize for your Grade level (Call 530-529-4890). Price is $65 per month and we will pay shipping one way, you pay the return.